In the days before diapers and drool New Year's Eve probably meant a chance to stay up late, enjoy a cocktail or two and celebrate another year. But, with the advent of little ones, your New Year's Eve celebrations probably look a little different. That doesn't have to be a bad thing. Ringing in the New Year with your family can be just as enjoyable if you do it the right way. Here are some suggestions for creating a fun and festive celebration without losing your sanity. This might be a no-brainer for those with small children. For those who have not yet experienced what happens when you keep your child up way past their bedtime, don't try it. They will still wake up at the crack of dawn and be even grumpier than usual. Instead, pick a time that will give them the sense that they are staying up past their bedtime, but won't be late enough to completely throw off their internal clock. 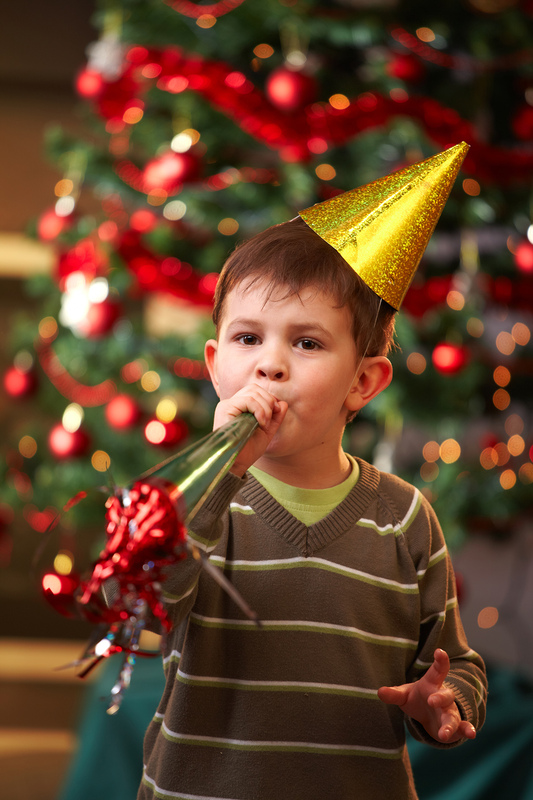 While New Year's Eve is generally thought of as an adult holiday, children can still get in on the celebratory fun. Try giving them milk in a martini glass with a rim coated in chocolate and sprinkles, or create Orange Apple Surprises (non-alcoholic mimosas) and pour them into wine glasses. Create a family time capsule by having each family member fill out a questionnaire (pdf) and putting them into a Mason jar or specially-decorated box. The kids will not only have fun documenting the previous year, but they will also enjoy opening the time capsule the following year and reading what they wrote. There's nothing more exciting than being surprised and making a mess, especially when you're a kid. Create some festive party poppers that will not only be a great way to ring in the New Year, but will also give them a treat to snack on while you and your spouse exchange a kiss. If you'd rather not make a mess, then try these shakers from Peacebutnotquiet.com that your kids can help make. If you have older children who are going to stay up later into the night, then it might be a good idea to give them something to look forward to. HoosierHomemade.com has a great list of goodie bags you can make that include everything from glow sticks to playing cards to candy and small toys. It's all about fun and celebration, so find what works for your family and have a Happy New Year!